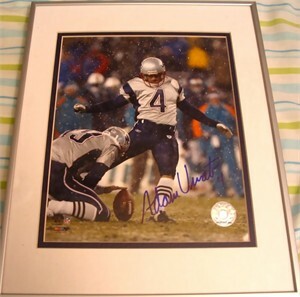 8x10 photo of former New England Patriots star placekicker Adam Vinatieri booting a field goal in the snow, autographed in blue marker. Professionally double matted in Patriots blue and white and framed in silver and plexiglas, ready to hang. ONLY 2 LEFT. With certificate of authenticity from Sports Images, which conducted the signing.